Packed with new features, DocPath announces significant expansion of its output management and spool management product offering.All new products integrate with the entire DocPath product line, delivering advanced capabilities to customers with varying needs. We are proud to launch advanced document technology and software that truly fits our clients' specific needs, enabling them to better communicate internally and with their clients. 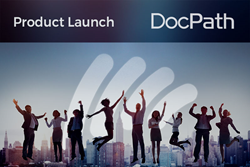 DocPath, a multinational company specializing in the development of advanced document software solutions, today announced a significant expansion of its document software portfolio with the introduction of new solutions that meet increasing market needs involving online and mobile data gathering, digital signature and print process optimization, among other features. All new software products integrate with DocPath's entire product offering, greatly expanding functionality and offering customers more options in enhancing and controlling the entire document process. DocPath's DataCapture solution puts a stop to manual data collection and overloaded document processes by providing companies of any industry with a flexible, online data-gathering and document automation tool. DataCapture users are able to easily design customized forms and then employ those forms for data collection from any mobile device. Gathered data can then be used to automatically populate customized and sophisticated transaction-ready business documents. Typical examples of use include onboarding prospective clients and contracts (banking), automatic check-in and surveys (tourism), admissions, loan requests and approvals (education), patient records and appointments (healthcare), delivery notes, bills of lading and service records (logistics), quotes, policies and claims (insurance). DocPath TonerMIST is DocPath's spool management solution that allows organizations to drastically reduce their toner costs with customized saving profiles and without penalizing printer speed. The document software solution comes with an easy-to-use central dashboard for management and control, while end-users just print as normal. This launch includes a "pay-as-you-save" price version: the price of the product depends on how much toner you save. DocPath PrintSLIM includes advanced document technology that offers a flexible print process optimization solution specifically designed to allow companies with geographically-dispersed offices to optimize and speed up their print processes by optimizing and/or compressing print files, thereby reducing bandwidth consumption and enabling faster overall print job transmission. PrintSLIM is compatible with any printer type (laser, inkjet, multi-function) and perfectly complements the features offered by DocPath's TonerMIST solution. DocPath PrintApp is an agile document print solution that allows business documents to be printed over the Internet or across the corporate network from any mobile device, such as tablets and smartphones. End-users access an easy-to-use app to print at their assigned printers, while the central server interacts with the app, receiving and processing print requests and securely sending the document to the PrintApp-enabled printer. Retrieval and distribution of any type of resource (documents, images, forms, fonts, etc.) from any type of source (document managers, directories, URLs, etc.). Format conversion to specific formats required for each document generation process. File merging, which may involve merging, in a single process, a retrieved document with a generated document to obtain a single document. DocPath tops off its 2Q2018 product launch with DocPath Leaf. This "entry" version of DocPath's document generation suites is the ideal complement to any of DocPath's newly launched document software products, as it provides all performance capabilities of the high-end product range, but at affordable prices that are adjusted to the real usage of DocPath's software in your business. "We listened to our customers' feedback and greatly enhanced and expanded our software portfolio to provide exponentially more functionality. As a result, DocPath is now offering new and existing customers greater control and enhanced document flows at affordable prices," says Julio Olivares, DocPath President and founder. "We are proud to launch advanced document technology and software that truly fits our clients' specific needs, enabling them to better communicate internally and with their clients." For more information about DocPath's new solutions, visit docpath.com. DocPath is a leading document software manufacturer that provides its world-wide customers the technology that allows them to implement of sophisticated Customer Communication and Document Output Management processes. Created in 1993, DocPath's solutions are found in companies all over the world. Among its international clients are prestigious banks and first class corporations, which are aided by DocPath solutions by simplifying the complicated and critical task involving the design and distribution of business and customer documents. DocPath maintains a strong commitment to R&D&i, an area that receives a good amount of its revenue, and in which lies the key to the company's success. Disclaimer: DocuSign is a registered trademark of DocuSign, Inc. DocPath is a DocPath Corp. registered trademark. All rights reserved. Other mentioned trademarks may be property of their respective owners. Document Generation Examples A brief introduction to our document software solutions Brief introduction to our company and clients.